In a move that will enhance customer experience and operational efficiency at security check points at Dubai International, DXB, and Dubai World Central, DWC, operator Dubai Airports together with Dubai Police General Department of Dubai Security signed a Memorandum of Understanding (MoU) with the International Air Transport Association, IATA, and Airports Council International, ACI, to become part of their joint initiative on Smart Security, in Dubai on Sunday. The Smart Security initiative aims to bring specific and measurable improvements in security effectiveness, operational efficiency and passenger experience at airport security checkpoints through better use of technology, process innovation, and the use of risk-based security concepts. The MoU will pave the way for Dubai Airports, together with airlines, control authorities, regulators and solution providers, to benefit from the knowledge and lessons gained through trials and research activities at other participating airports. “We manage the world’s busiest international airport with more than 90 million passengers passing through our facilities annually. To achieve our vision of being the best in customer experience as well as to provide the capacity to accommodate ongoing and future growth, it is imperative that we look to new technologies and processes to significantly reduce wait times and avoid queuing wherever possible. Our participation in the Smart Security initiative of IATA and ACI is a big step in that direction,” said Buti Qurwash, Vice President of Security at Dubai Airports. 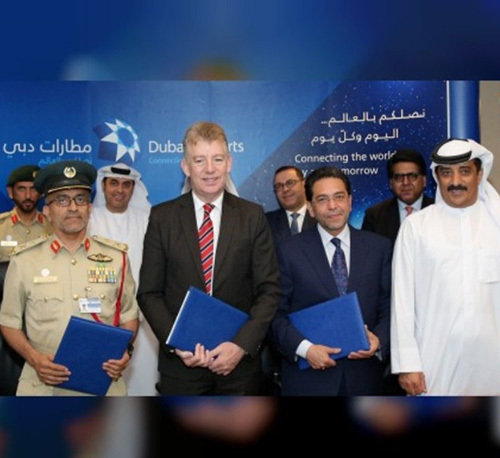 “We congratulate Dubai Airports and the Dubai Police General Department of Airport Security for their commitment to the introduction of the concept of Smart Security – a new global model for airport security - across Dubai’s airports. The deployment of innovative Smart Security solutions such as advanced screening equipment, lane automation and centralized image processing will not only improve passenger experience and boost the efficiency of the security process, but also ensure that the Dubai’s airports have a security solution that can be adapted to meet the expected growth in passenger traffic over the next 20 years,” said Muhammad Ali Albakri, IATA Regional Vice President, Africa and the Middle East. Major General Ahmad Bin Thani, Deputy Commander-in-Chief for Seaports and Airports Affairs at Dubai Police affirmed that the Smart Security program will contribute to the improvement of passenger experience at Dubai’s airports. "By making security checkpoints more efficient this program will have a positive impact on the entire travel process and experience across touchpoints from the curb to the boarding gate. It will also increase cooperation between all stakeholders, helping us to achieve our common objective of a secure airport with a smooth experience," he added.